Nantucket has 10 public beaches, a few for every preference: near or far, calm or surf. Right on the harbor, an easy stroll from the town center, it has a playground for the kids, picnic tables for all, toilets, showers, and a bandstand with free concerts on Thursday and Sunday evenings in summer. 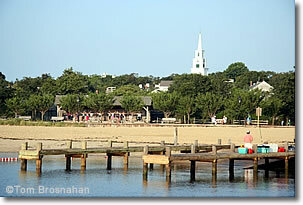 A short walk northwest from the town center toward Brant Point Lighthouse. You probably saw the beach when you came to Nantucket by ferry: it's the one on the starboard (right) side of your vessel. However, it is subject to strong currents and there are no facilities whatever and no lifeguard, so it's suitable for capable swimmers only. 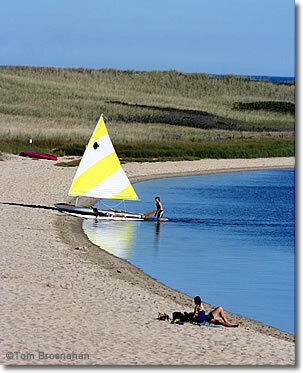 Nantucket's complete beach: not far from town, full facilities, great for families or indeed anyone. It offers a boardwalk to the beach, changing rooms, toilets, public tennis and volleyboall courts, a kids' playground, rental windsurfers, sailboats and kayaks, even beach-accessible wheelchairs. Come by bike or by NRTA shuttle bus. On the east side of the harbor, a five-minute walk from the town center, the waters are calm and thus relatively safe for kids, and though there are toilets there is no lifeguard. Nice broad beach with good facilities (lifeguard, toilets, showers), though it lives up to its name and the surf and breeze can be heavy at times (which makes it good for surfcasting fishers and kite-flyers). Bring a picnic as you're 2.2 miles (3.5 km) south of the town center, though there is a snack stand. Follow the bike path, or take the NRTA shuttle bus. West of Surfside on the south shore, it is farther from the town, with heavier surf, and less easily accessible, thus less-visited. There's a lifeguard, but no other facilities. A favorite with locals because it's three miles (5 km) west of town, and thus less crowded with mainland visitors. The dune-sheltered beach, calm waters, lifeguard, toilets and showers make it a good choice for families who can get there by bike. Like Miacomet, a south shore beach with heavy surf best reached by bike (4 miles from town along Hummock Pond Road). No facilities except a lifeguard. At the western tip of the island, this is where you go to watch the sunset rather than to swim, unless you like heavy surf. There's a lifeguard and toilets, and food sold nearby. Get there by bike (5.5 miles/9 km) or NRTA shuttle. Bring your bathing suit when you ride bikes or take the shuttle to 'Sconset and you can take a dip in the ocean as well as see the village, use the public toilets, and benefit from the cafés and restaurants. Above, Children's Beach, steps from town. Sesachacha Pond, north of 'Sconset.